today, i read a comment on sonny's blog http://mydunnvillegarden.blogspot.com/ by the "old geezer" http://ronjoewhite.blogspot.com/ and so i went to see who he was. 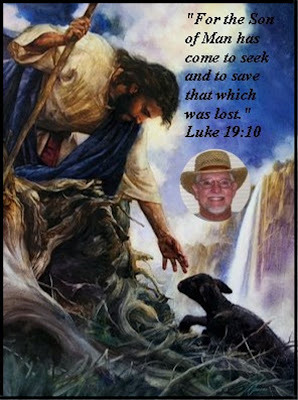 i found this wonderful testimony that he had written about how the lord had found him and saved him. WHO IS THE OLD GEEZER? Believe it or not I wasn't born an Old Geezer. I lived in Watts and Compton, California until I was almost 8 years old, with my mother, my father and my sister. When I turned 13 years old I started stealing liquor from some of the local markets and getting drunk with my buddies as often as we could. By the time I was 16 years old I was a full fledged alcoholic. By the time I was 21 years old I had been married and divorced with 2 kids and arrested 3 times for drunk driving. I remarried in 1972 to a women who had a disabled child and we had one daughter together. She married into hell on earth when she married me and after six years was ready to divorce me. In 1977 God saved my wife and she started to attend the Baptist church near our home and a bunch of women in her bible study started praying for her rotten drunken husband. In June of 1978 I was at my nieces graduation party (drunk as usual) and fell off some steps and broke out my front tooth. The next day when I woke up I said to myself this has got to stop and I quit drinking 'cold turkey' that day and to this day 'praise be to God' I've never had another drink of alcohol. Earlier that same year I started a new job as a truck driver in Los Angeles. It was about 1 and 1/2 years later my boss had me work with a Bible thumping Christian truck driver for 2 weeks, who I later found out was a converted drunk. He asked me if I had ever read The Bible. I said yes I read it once about ten years ago. He ask me what did you learn from it? I didn't have a answer for him. He asked me if I had a Bible at home and I said yes my wife had one. He challenged me to go home and read the book of Proverbs. I went home and opened up my wifes Bible and read through the book of proverbs. I read about wisdom and foolishness, right and wrong living, good and evil and verses about drunks and alcohol that hit me over the head like sludge hammer. I feel under deep conviction about my sinful life and saw myself as living the life of a fool. It was Easter of 1980 when I shocked the whole family and told them to get ready because we are all going to church. Through personal Bible reading, attending a good Bible teaching church and listening to Christian radio, God had mercy on me and by His grace He gave me the faith to believe on the Lord Jesus Christ and become saved. Fast forward thirty years: I retired a little over 4 years ago. I've been married going on thirty eight years, I've served in two churches as a deacon, a Sunday school teacher, a usher and have been actively involved in evangelism and discipleship. The Old Geezer has slowed down a little in the past few years. My primary ministry these days is helping my wife, my kids, grandkids, neighbors and sharing The Good News on: 'The Old Geezer Blog'. What a wonderful testimony Terry! I'll have to check him out! Your post on our blog made my day!!! This blogging can get rather lonely when nobody comments. We give so much of ourselves to get our messages and pictures out there. It is nice to feel appreciated. From reading more of your blog, I see how important religion is to you. Every Sunday for over a year, I have posted something "spiritual" on Sunday. I try to incorporate the many religions of Greensboro. So, Sunday would be your day to stop back for a visit. If you haven't discovered them already, visit Monastery Daily Photo and Jerusalem Hills Daily Photo. Even if your religion is different, you will learn a lot. You have warmed my heart with your precious story of swimming in the ocean (beats shopping any day)! A strong and honest testimony about God's saving and healing power. We need to hear more about the wonders of God to get strengthened in our faith. Too often we willingly share our pains and fears, but like the 9 lepers we go home without thanking. A bold man has shared his defeats and following great victory. No we weren't born "Old Geezers," but more and more I see one looking back at me from the mirror. Praising God for this testimony and it is encouraging me to pray for a relative who has an addiction. Thank you, Terry, for posting this. It is a wonderful testimony. Isn't it wonderful what our God can do for a person. He did for me and I thank him for it.